After you have done all of your preparation before your interview, it is time for the actual day to come. You are not done preparing yet, however. What you do before you walk into the interview office will be critical to how your interview goes. So, make sure that you give yourself ample time to be ready so you can put your best foot forward and maximize your brief time to leave an impression. Make sure that you have several copies of your resume printed and ready when you enter the interview office. 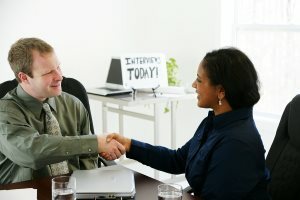 Don’t assume that the interviewer will have a copy, so having one to hand him or her will look professional and ready. Having several will ensure you’re prepared in case you meet more than one person in the process. Print out your reference list and make sure you are providing full and accurate contact information. Though there were likely references listed on your application, having a list will ensure you can give this information quickly if it is asked of you. Clean out your car, wash it, and ensure that your briefcase, bag, or purse are clean, in good condition, and contain only the items that you know you will need. You never know when the interviewer will have the opportunity to see your bags or will walk you out to your car. You don’t want to give the impression of being dirty or disorganized. Don’t bring your phone into the interview. Even if it is off, it will be a distraction. If you are given a phone number, write it down. You will have time to put it into your phone later, and you don’t want the interview interrupted by a sudden ring or buzz. Dress to impress. It’s a cliché, but it applies to an interview. Find out what the dress code is for an employee, and stick to that (unless, of course, there is some kind of uniform). The rule of thumb is that it is better to be a little overdressed than it is to be underdressed. Be respectful. Every person that you encounter during the day should be given a smile and a greeting. It is common for an interviewing manager to ask the opinion of a secretary or receptionist, and you want the person’s first impression of you to be positive. Use proper names. Familiarize yourself with the names of the people that are interviewing you. If you don’t know how to pronounce it, make sure that you ask right away. If this is done within the first few moments of interaction it is not considered rude or awkward. Just make sure that you ask respectfully and pleasantly, even with a bit of apology (“I’m sorry, but I just want to make sure I pronounce your name correctly. Could you say it again, please?”). Answer questions that are asked of you, not other ones. Don’t go on tangents or stray off into other topics just because you want to say something. The time will come for you to elaborate.